Today (February 7th) marks 1,000 days until the 2020 presidential election. That will take place on Tuesday, November 3rd 2020. There are 272 days until this year's midterm elections on November 6th. The last time a presidential election occurred on November 3rd was in 1992, when Democrat Bill Clinton defeated incumbent Republican George H.W. Bush. Republican Trey Gowdy of South Carolina and Democrat Bob Brady of Pennsylvania announced Wednesday that they will retire at the end of the year. This brings to 49 the number of current members not seeking reelection. 34 of those are Republicans, while 15 are Democrats. Gowdy, in his 4th term, chairs the House Oversight Committee, and is most well-known for chairing the Benghazi investigation. His 4th district includes much of Greenville and Spartanburg in the northwest corner of the state. Gowdy won reelection in 2016 by 36 points, while Donald Trump won here by 26 points over Hillary Clinton. The district is expected to remain in Republican hands. Brady, in his 11th term, has been shadowed by an FBI investigation into a payment his campaign made to a primary opponent in 2012. Brady was not charged, but a political consultant for the congressman pleaded guilty to lying about the payment. He represents Pennsylvania's 1st district, which is one of the most Democratic in the country. Both Brady and Clinton won here by more than 60 points in 2016. The district primarily runs along the Delaware River from Northeast Philadelphia to Chester. It will likely be redrawn if a recent court ruling is upheld. Brady is the 5th announced departure among the state's 17 current members. Pennsylvania's 18th district is vacant, and will be filled by a special election on March 13th. Gowdy is the first 2018 retirement from South Carolina's congressional delegation. Gallup has published Donald Trump's approval rating in each of the 50 states. This is based on over 170,000 interviews conducted during 2017. Trump's national approval rating averaged 38% during 2017, with 56% disapproving. Breaking it down by state, the results ranged from 26% in Vermont to 61% in West Virginia. (Washington D.C. gave Trump an approval rating of 6%). Gallup found that Trump had approval ratings above his 38% national average in 33 of the 50 states. This occurred because some of the states where he performs most poorly are very populous states like California. At a high level, this outcome sounds pretty similar to what we saw in the 2016 election, where Trump surpassed 270 electoral votes while losing the popular vote. Texas appears to be the biggest surprise; Trump's approval here was just 39%. A couple caveats to keep in mind: the surveys were taken over the course of an entire year, so not really a snapshot in time. Also, the surveys were of adults; no consideration given to voter registration status. That last point might help explain the low number in Texas, as Latinos have historically voted at lower rates than whites. 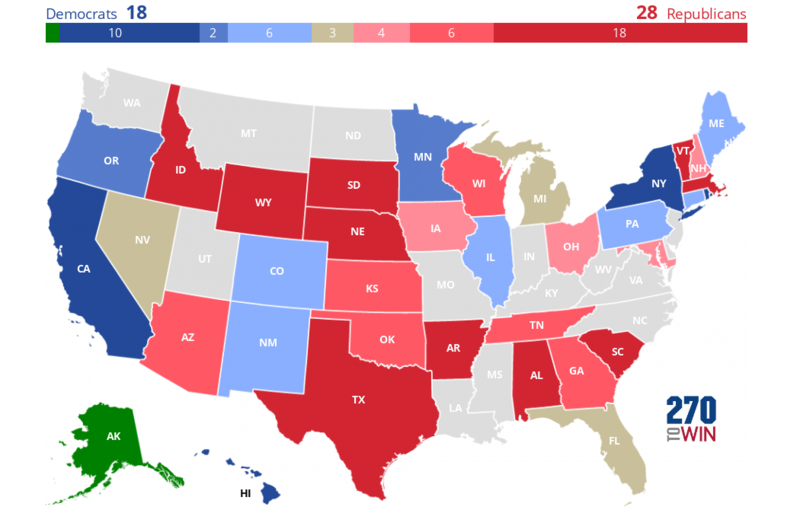 The above in mind, it probably isn't totally fair to try and translate approval ratings into a 2020 electoral map. Of course, if one published a website around electoral maps, they might do it anyway. So here it is. The map is interactive, so if you don't agree with our categorizations (below the map), you can change them and create your own. All states with Trump at 50% or higher shown as red. All states, except Texas, with Trump below 40% shown as Democratic. As it turns out, this is all the states Clinton won in 2016 except for Maine, New Hampshire and Nevada. Texas is shown as undecided/toss-up based on the above discussion. All states in the 40-49% range are shown as undecided/toss-up unless Clinton or Trump won it by more than 10% in 2016. There are eight states won by Trump that fit in this category; they are shown as pink in the map. District information is not provided for Maine or Nebraska, so the map ignores any split possibilities. New Jersey Rep. Rodney Frelinghuysen, who chairs the House Appropriations Committee, announced Monday that he will not seek reelection. Politico notes that "[he] is the eighth Republican committee chairman to forgo reelection in the House ahead of a midterm cycle that’s building against the GOP. But Frelinghuysen, whose district grew increasingly competitive in 2016, only served one full year as appropriations chairman and was not term-limited in his position, unlike other retiring lawmakers." While Frelinghuysen easily won a 12th term in 2016, Donald Trump only bested Hillary Clinton by 0.8% in the district, and the race was shaping up to be highly competitive this year even with the incumbent running. Three Democrats outraised Frelinghuysen in the 3Q of 2017. 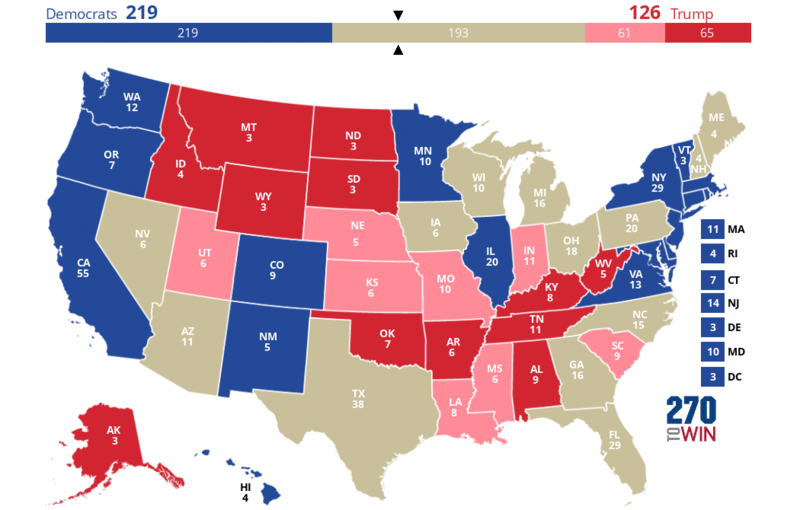 Sabato's Crystal Ball has moved the race from 'Leans Republican' to 'Toss Up'. It is one of five New Jersey districts that are likely to be competitive in 2018. Four are held by Republicans. Pennsylvania Rep. Patrick Meehan (PA-7) has announced his retirement from Congress at the end of this year. The four-term Republican has been under scrutiny in recent days after it became public that inappropriate behavior with an aide led to a settlement paid by Congress. Meehan was subsequently removed from his seat on the House Ethics Committee. Meehan's path to reelection in November was further clouded this week as the Pennsylvania Supreme Court ordered the state's congressional district lines to be redrawn for the 2018 midterms. The Court found that the lines established by the General Assembly back in 2011 violated the state's constitution. If the decision survives appeal, Meehan's suburban Philadelphia district will likely be significantly altered. That district is among the most gerrymandered in the entire country. Based on the retirement, Sabato's Crystal Ball has updated their rating from 'Leans Republican' to 'Toss-up'. It is likely that any acceptable redrawing of the district's borders will move the race in the Democrat's favor. Meehan is the 46th current House member, and 32nd Republican, to forego reelection in 2018. See the full list of retirements, which now includes the 2016 margin of victory within the district for both the House and presidential races. In terms of those on the list, Pennsylvania's 7th district is one of six Republican-held districts that were won by Hillary Clinton in 2016. There were 23 such districts nationwide that year. Three of the retirements are in Democratic-held districts won by Donald Trump in 2016. There were only 12 such districts in 2016. Visit our newly redesigned 2018 House Interactive Map to see these margins for any district in the country. The new 2018 House Interactive Map is live. There's a national map, as well as a map/URL for each individual state. Here's Texas. More features, including social sharing of individual forecasts, will be coming soon. In a split decision, the Pennsylvania Supreme Court ruled that the state's Congressional Redistricting Act of 2011 violates the state's Constitution, ordering the General Assembly to submit a revised plan to the governor by February 9th. Failing that, or if the governor doesn't approve the plan submitted, the Court will develop a plan for redistricting. The Court further directed that the new districts will be effective for the May 15th primary. The changes will not affect the March 13th special election in the 18th congressional district. The decision is being appealed to the U.S. Supreme Court, according to this AP article. Providing some background, the article states that "Republicans who controlled the Legislature and governor’s office following the 2010 census broke decades of geographical precedent when redrawing the map...they shifted whole counties and cities into different districts in an effort to protect a Republican advantage in the congressional delegation. They succeeded, securing 13 of 18 seats in a state where registered Democratic voters outnumber Republicans 5 to 4." Here's a map of the current district boundaries for the entire state, colored by party of the current incumbent, with the 18th currently vacant (was Republican-held). This 2nd map is the Southeastern corner of the state, the districts in and around Philadelphia. This is where some of the worst gerrymandering took place. District 7 (shown in tan) is sometimes referred to as "Goofy Kicking Donald Duck"; it is one of the most oddly-shaped districts in the country. Any approved redrawing of the lines will almost certainly benefit Democrats in November. In an already very competitive year, this will provide additional opportunities for that party to gain the 24 seats they will need to take control of the U.S. House. Telling the national GOP to "grow a pair of ovaries", Rep. Martha McSally joined the U.S. Senate race in Arizona Friday. She will compete against former State Senator Kelli Ward and former Sheriff Joe Arpaio for the Republican nomination. The winner will likely face McSally's Democratic House colleague Kyrsten Sinema in November. Incumbent Senator, Republican Jeff Flake is retiring. California Republican Darrell Issa will not seek reelection, he announced Wednesday. Issa narrowly won reelection in 2016. His roughly 0.5% margin of victory over Democrat Doug Applegate was one of the five closest congressional races in 2016. Hillary Clinton won the district by 7.5%, one of only 23 districts nationwide (7 in California) that elected a Republican to the House while supporting Clinton over Trump in the presidential election. Sabato's Crystal Ball has moved the 2018 race for the 49th district from Toss up to Leans Democrat. Issa is the 2nd California Republican to retire this week. Ed Royce announced his retirement on Monday. That race moved from Leans Republican to Toss Up. Worth Noting: Ratings for these races assume a Democrat vs. a Republican face off in November. However, California has a non-partisan primary, where all candidates compete on a single ballot, with the top two, regardless of party, moving on to November. Depending on the composition of the ballot it is possible for two candidates from the same party to advance to November, even in swing districts like Royce's 39th and Issa's 49th. 45 members of the House are retiring or seeking another office in 2018. Arizona Rep. Martha McSally will be added to this list Friday if, as expected, Rep. Martha McSally (R, AZ-2) announces her candidacy for U.S. Senate in Arizona. Ohio's Pat Tiberi (R, OH-12) will be removed from the list when he resigns on January 15th.